Convidamos para participar da palestra “Time-varying filtering techniques for RF front-ends”, a ser ministrada pelo Prof. Sudhakar Pamarti, Distinguished Lecturer (DL) of IEEE Solid-State Circuits Society, que é Professor da Electrical and Computer Engineering, University of California, Los Angeles, CA, USA. Sharp, programmable, linear, integrated filters are enabling components for software defined and cognitive radio applications. However, they are difficult to realize: SAW and MEMS based filters are sharp and linear but not very programmable; active filters can be sharp and programmable but are linear; sampled charge domain filtering is sharp and programmable but the burden of the linearity is on the front-end voltage-current converter. My group has developed a unique alternative that purposefully employs periodically time-varying circuit components to realize very sharp, linear, and programmable filters for use in RF front ends. This talk will describe how even simple 1st order RC filters can be converted into very sharp filters just by making one of the components, a resistor, vary periodically with time. The talk will show how our technique goes against conventional wisdom by exploiting sampling aliases rather than struggling to suppress them prior to sampling. It will describe how we applied the technique to realize RF front-ends and spectrum scanners with some of the best reported blocker suppression, linearity, and power consumption. Dr. Sudhakar Pamarti is a Professor of Electrical and Computer Engineering at the University of California, Los Angeles. He received the Bachelor of Technology degree from the Indian Institute of Technology, Kharagpur in 1995, and M.S. and Ph.D. degrees in electrical engineering from the University of California, San Diego in 1997 and 2003 respectively. He has either worked for, consulted with, or advised both software and hardware companies such as Hughes Software Systems, Rambus Inc., SiTime, Texas Instruments, Alterra, FemtoDX etc. on various aspects of wireless and wireline communications, and analog, mixed-signal, and RF integrated circuit (IC) design. 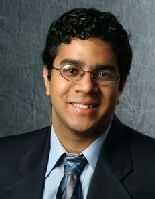 His research focuses on developing various techniques, especially signal processing ones, to overcome common impairments in ICs. This includes both establishing the theoretical basis of such techniques as well as demonstrating their efficacy using record setting prototype ICs. Dr. Pamarti is a recipient of the National Science Foundation’s CAREER award. He currently serves on the technical program committees of IEEE Custom Integrated Circuits Conference and IEEE International Solid State Circuits Conference, and has, in the past, served as an Associate Editor for both Parts I and II of the IEEE Transactions on Circuits and Systems. Quanto é 13 + 2 ?